The US Trade and Development Agency (USTDA) has signed a grant agreement worth $538,000 with the Middle Airports Corporation (MAC) to develop the Chu Lai International Airport. The information was announced by the Management Board of the Chu Lai Open Economic Zone in the central province of Quang Nam on October 23. 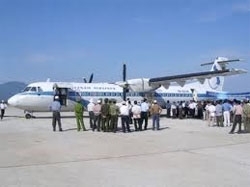 According to the Management Board, the grant will fund a feasibility study for the Chu Lai International Airport in Nui Thanh district, which will be carried out between now and 2012. The study will put forth planning and construction options in order to make Chu Lai a regional air cargo hub while expanding its passenger traffic capacity. It will also determine the market potential, identify the infrastructure needs, and recommend a public-private investment and financing agreement for the airport expansion plans. Currently, the Chu Lai airport, located approximately 56 miles southeast of Da Nang , handles 40,000 passengers per year and no cargo. This study will assist MAC in developing a plan to reach 5 million tonnes of cargo and 4 million passengers by 2030. Chu Lai Airport is operating 10 flights from Chu Lai to Ho Chi Minh City and four flights to Hanoi per week.